Delhi Agra Jaipur with Varanasi Tour package, a journey including three cities Delhi, Jaipur, Agra is in itself exciting and indulging, adding on to this adventure with the holy city of Varanasi or popularly called Benares- ‘the city of ghats’ would be an experience worth living and reminiscing. These four cities embrace within themselves four different tastes of cultural background. While Delhi and Agra would give you a glimpse into the Mughal culture, Jaipur would give you a look into the Rajputanas and Varanasi would kindle your religious flame. This is to a great Journey ahead!!. Explore the Qutub Minar and the streets of Chandni Chowk. The breathtaking Ganga Arti and boat rides. Visit Amber Fort and Jantar Mantar. Check in at hotel with our representative, in Delhi. Freshen up and proceed to cover old Delhi area including Jama Masjid, Red Fort and Chandni Chowk. Stay overnight in the hotel. Covering the areas of New Delhi, visit the Laxmi Narayan temple, India Gate and the Gandhi Memorial also covering the Parliament House, Humayun’s Tomb and the Qutub Minar. After this, continuing this journey proceed to Jaipur by road. Check in to the hotel for a night stop-over. With the most awaited and popular ride of elephants, travel through the Amber Fort. Witness the Merge of Mughal and Rajasthani culture in the architecture of City Of Palace and also visit the Jantar Mantar and Hawa Mahal. The local markets of Jaipur are every shopper’s dream, with a wide variety of artifacts and clothes; it will always serve as a reminiscent of your trip to India. After a light breakfast, begin the journey towards Agra, visiting the ruins of Fatehpur Sikri- a world heritage site by UNESCO, en route. After exploring Fatehpur Sikri and its monuments, we reach Agra check in to the hotel. Rest of the day is at leisure. Stay overnight at the hotel. 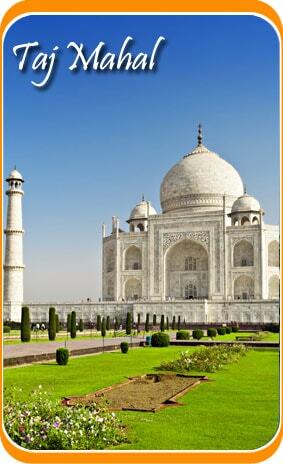 Witness the beauty of Taj Mahal which transcends time at the sunrise. Explore the grandeur of Agra Fort and the Id-Mat-Ud-Duala’s Tomb. Catch a train by the evening leaving for Varanasi which would be an overnight journey. Assisted by our representative check in to the hotel. Freshen up and visit the Sarnath, which is an important Buddhist pilgrimage site. Afternoon trip would include the of Varanasi city including places like Alamgir Mosque or Beni Madhav ka Darera, Ghats of the Ganges and the Bharat Mata Temple. Spend the evening alongside the river Ganga with the enchanting Ganga Arti going on. Stay overnight in the hotel. With the dawn breaking, enjoy a boat ride at the river Ganga and witness the famous Subah-e-Benares. After the breakfast, proceed to the airport for a flight to back home. Your Delhi Agra Jaipur with Varanasi tour ends here.